Leave it to the Japanese to make a toilet training device with no sense of shame but an overdeveloped sense of theatre and the bizarre. Stolen from JapanProbe, here is the World Famous Shimajiro Toilet Training video, subtitled in English. Over at JP they have the actual sounds the machine makes as MP3 files as well: if only this little device looked like the Dora the Explorer aquapet, my day would be complete! Listmania! 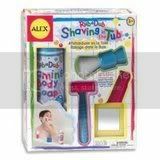 Rub a Dub Dub… Bath Toys! I know that there are adults out there who do not like baths. I am not among them, although I readily admit to taking very few baths. But the idea of a bath is absolutely smashing. Most kids I know like taking a bath, and part of that is having some good bath toys to play with whilst waiting for all the bubbles to pop. 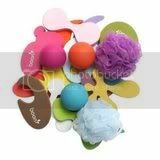 And, if you have a reluctant bather, then enticing them with some really good bath toys just might convince them to spend more than five minutes in the water. Minus the screaming, too, of course. Boon Bath Goods Soft and squishy contemporary toys that don’t absorb water, thus lessening the mildew factor. Comes with fifteen bath appliques, three silicone balls, and two mini-scrubbies. 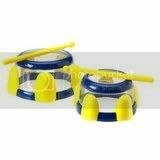 Tub Tunes Water Drums Floating drumset allows you to change the pitch by adjusting the water level. Too cool! Floating Blocks Use the board provided to stack blocks, and it even comes with its own mesh bag for storage. Which is always handy. 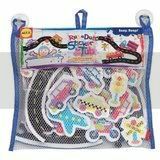 Rub a Dub Stickers for the Tub Twenty seven foam cutouts of cars, trains, and motorcycles allow for lots of creative fun. Also has a mesh storage bag. 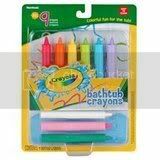 Crayola Bathtub Crayons Allow your young Picasso to use the entire bathtub and surrounding walls as their canvas! I speak from personal experience in saying they come off easily with a tiny bit of elbow grease. Crayola Floating Art Desk Or if you prefer to keep them limited, this is just the thing. 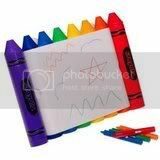 Has a built-in storage compartment for the crayons. Crayons included. 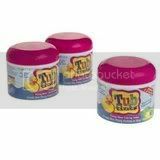 Crayola Bathtub Tints They will love watching these tablets fizz (a la Alka Seltzer) in the tub, changing the color of the water. Use the single colors, or mix to create new colors. Non-irritating and will not stain the tub or the kid. Shaving in the Tub A must for any boy that wants to be just like Daddy. Get your camera ready for this one. 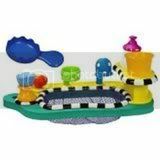 Bathtime Kitchen Sink Help develop motor skills with eight different activities including scooping, pouring, straining, and squirting. Comes with a terry cloth scrub brush and storage bag. 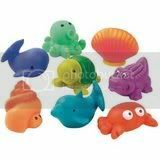 “Sea” Bath Squirties What is bathtime without some squirties? These are definitely the cutest ones around.